The Arkansas Rep kicked off 2014 with the Pulitzer and Tony winning CLYBOURNE PARK. Both a prequel and sequel of sorts to A Raisin in the Sun, it looks at the life of a house and a neighborhood. In 2014, Arkansas Repertory Theatre brought the play to Little Rock in a production directed by the founder of the Rep, Cliff Baker. The cast included Shaleah Adkisson, Ryan Barry, Katie Cunningham, Lawrence Evans, LeeAnne Hutchison, Robert Ierardi, Jason O’Connell, and David Tennal. The creative team included scenic designer Mike Nichols, costume designer Yslan Hicks, lighting designer Yael Lubetzky, sound designer Allan Branson and properties designer Lynda J. Kwallek. While A Raisin in the Sun did not win the Pulitzer, it did inspire a sort of prequel AND sequel which did win that award. 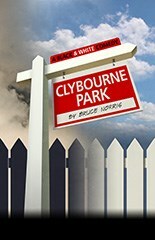 Bruce Norris’ Clybourne Park was inspired by the earlier play. After an Off Broadway production in 2010, it won the 2011 Pulitzer for Drama. A subsequent Broadway production won the 2012 Tony for Best Play. In 2014, Arkansas Repertory Theatre brought the play to Little Rock in a production directed by the founder of the Rep, Cliff Baker (up next at the Rep with God of Carnage which closes out the 2017-2018 season). The cast included Shaleah Adkisson, Ryan Barry, Katie Cunningham, Lawrence Evans, LeeAnne Hutchison, Robert Ierardi, Jason O’Connell, and David Tennal. The creative team includes scenic designer Mike Nichols, costume designer Yslan Hicks, lighting designer Yael Lubetzky, sound designer Allan Branson and properties designer Lynda J. Kwallek. Clybourne Park, Bruce Norris’ Pulitzer and Tony winning play, is about race and place. But it is not a pedantic treatise meant to induce guilt. Through its humor and honesty it examines prejudice, property value, and protection of principles. The prejudice on display is not just racial, but also extends to gender, class, disability and sexual identity. The characters are alternately clinging to a past as well as trying to bury it. If this sounds like heavy stuff, it is. But it is presented in such a way, that it does not seem weighty or oppressive. The action of Clybourne Park takes place in the unseen house that was the crux of Lorraine Hansberry’s A Raisin in the Sun. The conceit of Norris’ play is that fifty years separate the first act from the second one. Though played by the same actors, the characters are different in the two acts. Neither the playwright nor Cliff Fannin Baker, the director, hit the audience over the head with the connections the second act characters have to the first act or to the Hansberry play. They let things emerge organically. The people in this play are rarely who they seem to be. Allegiances shift throughout each act as layers are peeled back on the characters and their motivations. It is cliché to say, but this play is truly an ensemble piece. As such, Norris (an erstwhile actor himself who once was directed by Baker) has provided each actor with moments to shine in both acts. When given these moments, the actors seized them. In quieter moments, the members of the ensemble exhibited wonderful performances as well without stealing focus from their fellow actors. Shaleah Adkisson is marvelous both as a long-suffering maid and wife in the first act and a neighborhood activist in the second act. Her voice can drip honey and cut like a knife at the same time. Katie Cunningham plays an expectant mother in both acts. In the first act her character is deaf, while in the second act her character can hear perfectly (but may wish there things she didn’t hear). Shifting from prim to relaxed in the two acts, Cunningham creates two distinct characterizations on stage. LeeAnne Hutchison’s first act housewife is appropriately daffy and warm. In the second act, she transforms herself into a self-absorbed, calculating professional by use of a different voice, demeanor and posture. As Hutchinson’s husband in the first act Robert Ierardi portrays a man wrestling with emotions and changing times while trying his best to continue to provide for and protect his wife. His interaction with Hutchison during the opening of the first act captured the dichotomy of comfort and confrontation found in long-married couples. Ryan Barry’s harried priest in the first act is doing his best to be helpful and remain calm in the midst of a sea of turmoil. In the second act he is a bemused, detached attorney trying to facilitate conversation between opposing parties. Though the reactions are different, in both acts his character is pushed to a brink long after other characters have been. In many ways, he is a barometer for the audience. Lawrence Evans has little stage time in the first act but creates a memorable character as a husband just trying to be helpful. In the second act Evans has more opportunity to shine as a neighborhood resident working to preserve his community, and perhaps understand his wife as much as he is trying to understand some strangers. In the first act, Jason O’Connell plays Karl, a character who appeared in A Raisin in the Sun. While not trying to justify his racist actions, this play fleshes out Karl. O’Connell’s characterization is not a broad villain, but it does not try to make excuses for his beliefs. He also handles some physical comedy in a manner that is both humorous but also completely in character. In the second act, O’Connell’s character is more naïve on some levels as he is confronting aspects of himself and his wife (played by Cunningham) that had never been considered. Rounding out the cast is David Tennal, an alum of the Rep’s Summer Musical Theatre Intensive, in a small but pivotal role at the end of the play. It is always nice to see students who came up through the Rep’s SMTI program hold their own on mainstage productions. It was nice to see Rep veterans Adkisson (Avenue Q), Evans (Fences) and O’Connell (All My Sons, Sherlock Holmes, Frost/Nixon) return and create memorable characters. Based on their performances in this play, hopefully Cunningham, Ierardi, Hutchison and Barry will be back in the future. The seamless direction provided by Baker well-serves the actors and Norris’ masterful script. It is obvious that in rehearsal Baker created an atmosphere of trust and collaboration among the acting company. Together he and the actors have mined the play for its much needed humor. But they did not settle for cheap laughs. The play uses laughter to relieve tension. But it does not shy away from making the audience or the characters onstage uncomfortable. Baker and his cast know when to let the feelings of unease simmer. In Baker’s hands, the play never seems pious but it does show the challenges of building and maintaining a community when often well-meaning people have competing perspectives. While the acting ensemble could have undoubtedly sold the play performing in street clothes in a bare stage, luckily they did not have to. The physical design supported the play. Mike Nichols’ set is in many ways another character in the play. He has created a pre-war two story house. While the play is set in a fictional Chicago neighborhood, the actions in the play could easily take place in any mid- to large-sized American city over the past half century. In the first act, Nichols’ house is the epitome of the emerging middle class. The second act shows the same house after years of neglect. With only a few physical changes, the difference is stark. Yslan Hicks’ costumes ably showcase not only the different time periods but also the different stations in life of the characters. Through exacting details, her costumes enable the characters to look like they have stepped out of magazine photos from the two eras. Yael Lubetzky’s subtle lighting adds atmosphere to the play. The early morning shadows cast in the final moments of the play were particularly memorable. As sound designer, Allan Branson not only set the mood with music but had the unenviable task of ensuring that numerous actors talking over each other throughout the play could still be heard. Lynda J. Kwallek has a knack for finding props which tell the audience about the characters and their stations in life more than spoken words can do. Whether we know it or not (or are willing to admit it) Clybourne Park is all our story. There are times we each feel like an outsider, a protector, a denier, a fighter, a detached observer, a victim or a peacemaker. The play offers no easy answers or pat conclusions. In fact it’s one message seems to be that unless we continue to have these messy conversations we will never move forward. We must respect each other and see value in each other. But we must not be afraid to engage each other in meaningful and often complicated dialogue. If that doesn’t happen, sectors of the community will continue to move back and forth sliding past each other like some sort of societal amoebas without respecting differences. A final note, some of the language in Clybourne Park is harsh. There are words said on the stage that could definitely offend theatregoers. But the use is not gratuitous. It is to highlight how words do matter, but also ideas. Audience members should not let their distaste for those words detract from their play-going experience. Kudos to Rep Producing Artistic Director Bob Hupp for choosing this play for Little Rock audiences. Little Rock audiences need to pay a visit to Clybourne Park. It runs only through February 9. For those who want to laugh and think, this is one property not to be missed. Due to a cut and paste error, an earlier version of this review inadvertently omitted a section on Robert Ierardi’s performance. This review has also been edited because the author of it is constantly tweaking his writing. A few seasons ago, the Arkansas Rep produced Lorraine Hansberry’s seminal work A Raisin in the Sun. Tonight the Rep opens a production of Bruce Norris’ prize winning play Clybourne Park which explores events which happened before and after Hansberry’s play. The Arkansas Repertory Theatre works in partnership with the Clinton School of Public Service to participate in the UACS’s Distinguished Speaker Series, hosting educational panel discussions on various Rep productions. The latest in these takes place today, Thursday, January 23 at 12 noon at Sturgis Hall in Clinton Presidential Park. Arkansas Repertory Theatre producing artistic director, Bob Hupp, will host a panel discussion on the upcoming production of Bruce Norris’ Clybourne Park, winner of the 2011 Pulitzer Prize and 2012 Tony Award for Best Play. Clybourne Park is a bitingly funny and fiercely provocative new play about the volatile combination of race and real estate. In 1959, a white couple sells their home to a black family, causing uproar in their middle-class neighborhood. Fifty years later in 2009, the same house is changing hands again and neighbors wage battle over territory and legacy revealing how far our ideas about race and gentrification have evolved. Panelists director Cliff Fannin Baker, Jess Porter and John Kirk from the UALR History Department, along with Bob Hupp, will discuss how Clybourne Park relates to issues of race, real estate, history, and legacy in our own community. Clybourne Park opens tomorrow night (with previews last night and tonight). It runs through Sunday, February 9. Wednesday, Thursday and Sunday evening performances are at 7 p.m., Friday, Saturday evening performances are at 8 p.m. Sunday Matinees performances are at 2 p.m.